511 leather belts are made for everyday-casual, plainclothes or undercover wear and compliment your 511 Tactical Pants perfectly. Belts are 1-1/2" wide, full grain leather, and have a Permastiff® insert to provide stability for your sidearm. A hidden key keeper is secreted away on the back of the inside of this 511 belt. Black belts include a nickel plated buckle. Each buckle features 5.11's "I-Beam" construction for rugged durability. This belt is stable and holds the weapon in place, providing for a secure draw. Fit is true to your normal size belt. 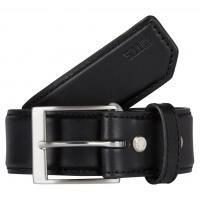 The belt is 14" thick and 1-12" wide so it is very strong and has nice nickle buckle. Great, my P-83 everyday carry doesn't roll my belt over any more.